KUALA LUMPUR (Oct 30): The FBM KLCI closed marginally higher by 3.23 points or 0.18% amidst lack of fresh buying impetus, following the recent rebound from the selldown. 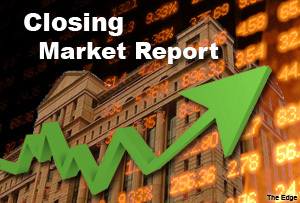 The benchmark index closed at 1842.78 points at 5 pm today. Trading volume across the board dropped to 1.8 billion shares worth RM2.15 billion, from 2.01 billion shares worth RM2.11 billion. Danny Wong, CEO of Areca Capital Sdn Bhd, said trading activity in Bursa Malaysia was muted and “lacking in catalyst”. “You can see that the KLCI has moved up a little bit today. There has been nothing much to push the market forward, or to kick start a buying or selling spree. You will not see much movement in the KLCI for a few days, I believe,” Wong said. Wong said the equity markets are awaiting the clues on when the US Federal Reserve would readjust its interest rates policy. Yesterday, the US Federal Reserve announced it has ended its quantitative easing (QE) programme of bond purchases. Wong said US is unlikely to change its interest rate policy until the second half of 2015, as the global and European economies remain “quite fragile”. “However, they are also sensitive to how Europe is doing, because the European market is a big consumption market and will affect the US economy directly,” he continued. On the impact of QE ending to the Malaysian market, Wong said, “The decision to stop QE is something that the Malaysian market has been expecting for some time. KLCI has not really reacted to it,” he said. Dagang Nexchange Bhd toppped the most actively-traded list, followed by Naim Indah Corp Bhd. Dagang soared 29% or 8.5 sen to 37 sen, with 80.95 million changing hands, while Naim Indah rose one sen to 13.5 sen, with 60.5 million shares traded. Today’s top gainers were Allianz Malaysia Bhd, Press Metal Bhd and PPB Group Bhd. Meanwhile, top decliners consist of Kuala Lumpur Kepong Bhd, British American Tobacco (Malaysia) Bhd and Oriental Interest Bhd. Asian stock markets were mostly lower, following the overnight losses on the Wall Street. Over at the foreign exchange market, the US dollar surged to a three week high against the Japanese yen, after the US Federal Reserve’s decision on ending QE. Regionally, the South Korea’s Kospi was down by 0.11%, Japan’s Nikkei rose 0.67% and Hong Kong’s Hang Seng was lower by 0.49%.